I Skate, Therefore I Am: Skateboard & Afghanistan on the same page? There was a time when you could not have the words “skateboard” and “mainstream” in the same sentence without an upheaval from the skater’s community. How about the words “skateboard” and “Afghanistan” in the same sentence? Take a look at today’s Los Angeles Times cover page. That’s confusing. Is the subject about skateboarding or about Afghanistan? Well both, but, rather than focusing on the violence of the local conflicts, the subject is creation via skateboarding. Creation of trust between the instructors and the kids, creation of fun, creation of a school through large donation and creation of a team that might participate in the next worldwide championships via the creation of new opportunities to develop skills in healthy habits, civic responsibility, information technology, the arts, and even languages. That creation has been called Skateistan . 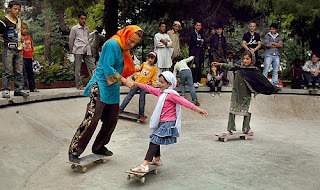 This and other Skateistan accomplishments have also been featured in different of other media such as US’ The New York Times, Time Magazine, and NBC, UK’s The Guardian and many others from all around the world (check Skateistan’s In The Web for the complete list). 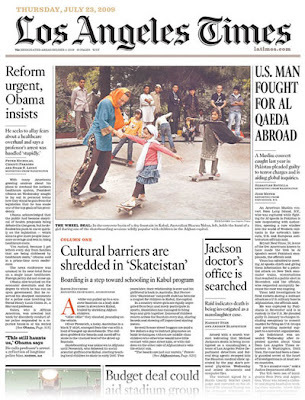 Skateistan’s major achievement is the creation 19,000-square foot skate park currently under construction in Kabul. Originally priced at US$1M, its erection became possible thanks to donations from sponsors like the governments of Germany, Norway, Canada and Denmark ; the Afghanistan National Olympic Committee and a variety of international companies such as Black Box Distribution and TSG. Once completed, it will be the country’s largest indoor sports facility.